Mmm....Angora. I love the stuff whether it's in the form of wonderful yarn or a simplyl delightful Angora Bunny. 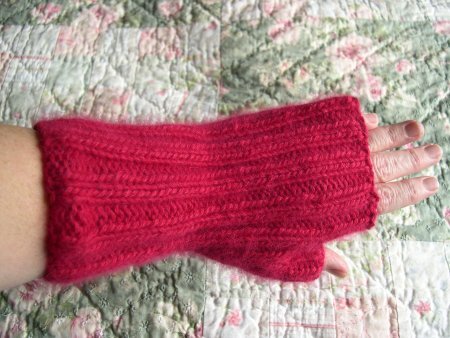 Last night, I finished knitting something that is just about as warm and soft as that little place behind Phoebe's ears--the first mitt of a pair of fingerless mitts for myself. I'm using this pattern more or less and Reynolds Devotion yarn. The yarn is roughly 50/50 angora/nylon. It has such a nice halo! I just love that. The color is so pretty, too. The photo below is pretty close but perhaps a little more hot pink and less red in person. My row gauge is a little off from what the pattern specifies, but these things are so forgiving. I just kept trying on my mitt and making notes so that I can duplicate the second one. When I slipped this thing on, my hand wanted to do a happy dance!! Lovely and just in time for the cold snap. Glad to see that you got your knitting mojo back. I love angora as well. You should also check out Louisa Hardings Angora Pure and Kimono Angora. It's absolutely beautiful.